A fossil group is defined as a group where a giant elliptical embedded in a X-ray halo with a luminosity 10-60% of the Virgo X-ray halo dominates the galaxy luminosity function, the next brightest group member being at least 2 magnitudes fainter. These systems were discovered by thanks to the X-ray satellite ROSAT. The archetype is RX J1340.6+4018, at z = 0.171, with an isolated, bright (MR=-22.7) elliptical galaxy surrounded by a halo of hot gas and dark matter. Fossil groups host nearly all field galaxies brighter than MR=-22.5, have mass-to-light ratios comparable to Virgo (M/LR ~ 300) With a number density ~ 2.4 ·10 -7 Mpc -3, they are not rare: they corresponds to ~ 20% of all clusters and groups with an X-ray luminosity larger than 2.5 ·1042 h50- 2 erg s-1. We use a set of twelve high-resolution N-body/hydrodynamical simulations in the LCDM cosmology to investigate the origin and formation rate of fossil groups (FGs), which are X-ray bright galaxy groups dominated by a large elliptical galaxy, with the second brightest galaxy being at least two magnitudes fainter. The simulations invoke star formation, chemical evolution with non-instantaneous recycling, metal dependent radiative cooling, strong star burst driven galactic super winds, effects of a meta-galactic UV field and full stellar population synthesis. All the selected groups have similar mass but random merging history. We find an interesting correlation between the magnitude gap between the first and second brightest galaxy and the formation time of the group. It is found that FGs have assembled half of their final dark matter mass already at z>1, and subsequently typically grow by minor merging only, wheras non-FGs on average form later. The early assembly of FGs leaves sufficient time for galaxies of L ~ L* to merge into the central one by dynamical friction, resulting in the large magnitude gap at z=0. A fraction of 3326116% of the groups simulated are found to be fossil,	whereas the observational estimate is ~ 10-20%. The FGs are found to be X-ray over-luminous relative to non-FGs of the same optical luminosity, in qualitative agreement with observations. Finally, from a dynamical friction analysis is found that only because infall of L ~ L* galaxies happens along filaments with small impact parameters do FGs exist at all. 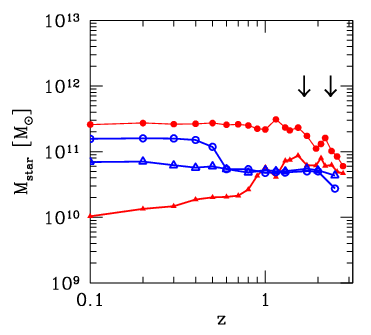 The upper figure displays an interesting correlation between formation time of the group, defined as the epoch at which 50% of the system's final virial mass is assembled, and the magnitude gap D m12,R. This correlation indicates that FGs are systems formed at z>1, and evolved relatively quietly until the present epoch, whereas non-fossil groups are generally late forming. The earlier a galaxy group is assembled, the larger is the magnitude gap. The dashed line is the definition for fossil groups. 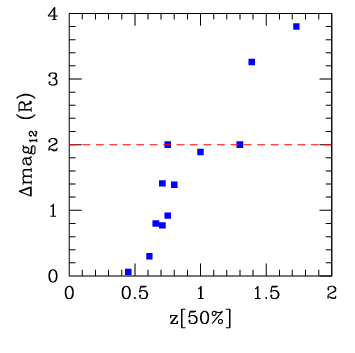 The lower figure shows evolution of the stellar mass of brightest galaxy (BG) (filled circles) and the	second brightest galaxy (BG2) at any given time (filled triangles) for a fossil group. Note that for the fossil group the BG2 is the second brightest object at each output time. The BG2 merges into the BG at z=2.2 and the last major merger of a BG2 into BG occurs at z=1.4 (indicated by arrows). For a non-FG is shown M*(z) of the galaxy which becomes the final BG1 (BG2) by open circles (triangles). For more informations see the full article in ApJ.